England. 1985. Jennifer Rush tops the charts and big hair is all the rage. But Britain’s youth are restless. They have no work, no money, no hope. And in the seaside town of Penzance in Cornwall, a group of mates decide to do something about it. When two of them embark on a charity bike ride from John O’Groats to Lands End, what could possibly go wrong? A rip-roaring and rollocking romp, brought to life in trademark Silly Boys style… With live music, puppets and a whole heap of silliness! 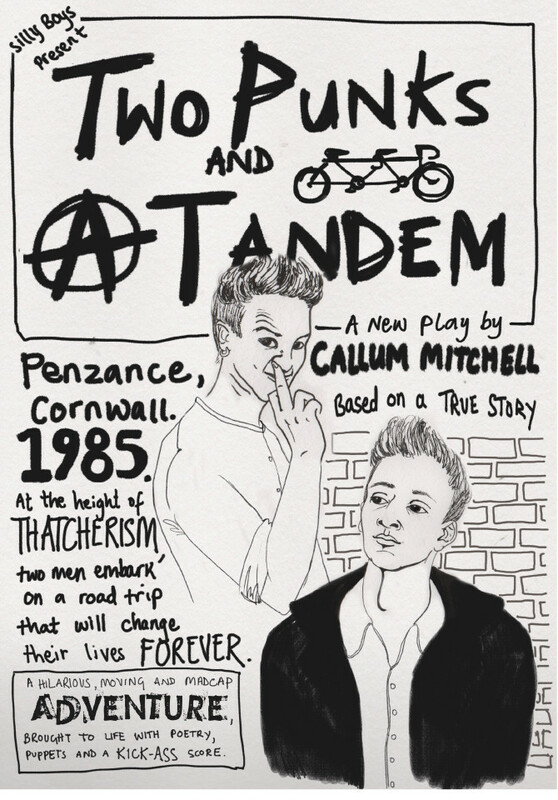 Two Punks And A Tandem is an ode to the power and spirit of community in increasingly individualistic times. Supported by Bristol Old Vic Ferment, Arts Council England and donations made by members of the public via a Kickstarter campaign we completed in 2014.